Tasty Puff Sprays are a great alternative to flavoured tobacco and rolling papers, and are available in a range of mouth-watering flavours. Tasty Puff Sprays can be used on cigarettes, cigars, tobacco, blunts and can even be added to the water in your bong to create a taste sensation. These compact spray bottles contain 1 fluid oz of flavour and are simple and easy to use. Simply spray some of the flavour onto your preferred smoke and leave for a couple of minutes before lighting. 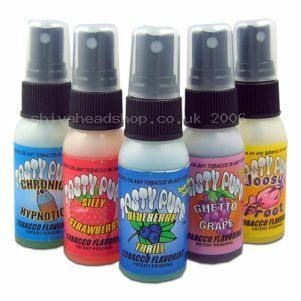 Tasty Puff Sprays are available in five fantastic flavours including strawberry, blueberry, grape, chronic hypnotic and joosy fruit. You can also mix the flavours to produce your own special blend. Tasty Puff Sprays are available now for £8.99 each or two for £15.99. Fancy adding a bit of flavour to your cigarettes but don’t want to buy flavoured tobacco? Then the new spray flavours from Tasty Puffs is for you. An alternative to flavoured tobacco and flavoured rolling papers, Tasty Puff sprays cigarettes a great taste and are available in a range of flavours including blueberry, grape and strawberry. To use simply spray a small amount onto your tobacco, rolling papers or even into your bong water to give it a flavour kick, leave for a couple of minutes to infuse and smoke. Tasty Puff Sprays are available now for just £8.99 per bottle.